Another major step northwards has been completed today through Italy, ending north of Milan. The top 20 is unchanged but there has been some shuffling of positions lower down after minutes lost at some of the day's controls. The Dodwell/Obert Hillman Hunter leads the ladies section by more than four hours and, major developments apart, there looks to be little likelihood of the British team of Sternberg/Gillies team in their Volvo reeling in the USA crew. The USA crew asked rally chief, Philip Young, many months back what car they should enter. Philip recommended the Hunter as the most likely vehicle to complete the distance. His view seems all the more accurate in the light of the performance of the Iranian-entered Hunters, which all still reside in the top ten. 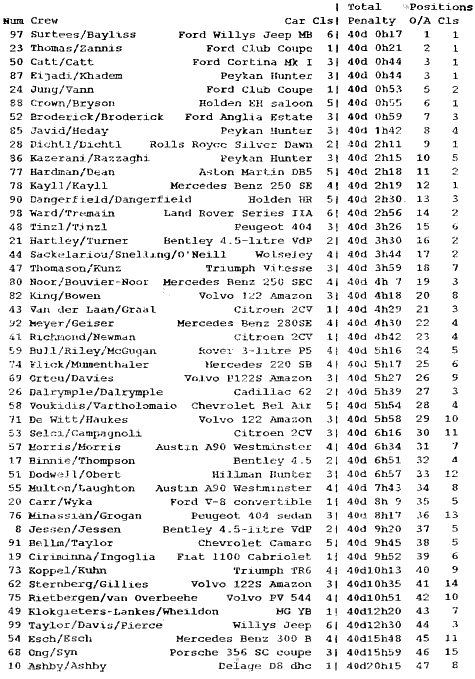 Paul Minassian's Peugeot 404 is still back in 36th place having inexorably worked its way up from the back of the field. He must reflect bitterly on the big penalty he received for forgetting his time card back in the early days of the event. Without the huge penalty that resulted he would surely be within the leading group. Johan Van Der Laan, whose Citroen 2CV was second overall for much of the event, is now driving with renewed vigour, inspired by the news that he has become a grandfather during the course of the event. From the leading Jeep on just 17 minutes penalty, to the 1932 Packard bringing up the rear of the touring class with more than 19 days in black marks, the rally moves closer to the finish on Saturday. No fewer than 82 cars from 94 starters are recorded as still participating. And there are more besides. Herman Layher with the 1907 La France has unofficially rejoined the event, having recovered from his pneumonia and hypothermia contracted in Tibet. The Cohens, whose Stutz retired early have also returned, albeit in a Bentley instead!